To discuss your home improvement needs in detail, please complete the form on the right. Tell us when you are available and we'll arrange for one of our representatives to visit at your earliest convenience. Our appointments are free and there is no obligation to buy. We know how important it is that your roofline is kept in good condition. It is vital to ensure that rot and weather damage does not spread into the eaves of your roof, making your home damp and creating the perfect conditions for the growth of mould. Maintaining your roofline can be stressful, time consuming and expensive. With Premier Glazing Roofline you can be confident that you’ll have perfect protection against the elements. All of our roofline products are made with virtually maintenance-free uPVC, which requires no regular upkeep. In fact, uPVC can be wiped clean with a damp cloth, so you won’t need to be hard at work on your roofline on days when you’d rather relax in the garden. 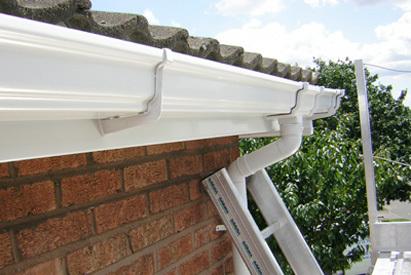 Our high-quality guttering will collect the rainwater that falls on your roof and protect your property from water damage. Protect the foundations of your home by channelling rainwater away from the base and safely draining it away. Soffits keep the under-surface of the overhang of your roof looking clean and tidy. Protecting the roof timbers from the elements, Bargeboards keep your roof lining looking smooth and consistent. Cover and protect the ends of your rafters with elegantly curved fascias, uniquely designed to match our uPVC casement windows. Replace rotten or weather-damaged wall surfaces with attractive and durable cladding. Keep your gutters and pipes free from blockages with gutter guard, designed to handle even the worst British weather. A 10 year guarantee is offered on every one of our uPVC roofline products. You can therefore be rest assured that all maintenance and care, as well as repairs and replacements, are completely covered. 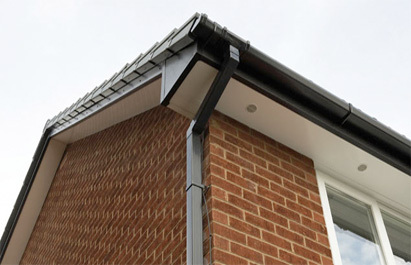 For more information about our roofline products, and to book a free, no obligation quote, call us on 01535 681800. When you choose Premier Glazing, you are guaranteed the highest quality of craftsmanship together with complete control of manufacture, which means we can guarantee your satisfaction with every one of our products. By installing our expertly manufactured A-rated windows, doors or conservatories, you will enhance your home and increase your comfort while enjoying that all-important peace of mind. Each frame offers superb protection all year round plus thermal insulation that keeps your home warm, dry and draught free.